The Consumer Technology Association (CTA) staged its annual CES 2019 tradeshow in Las Vegas during the first week in January, drawing more than 180,000 international visitors to southern Nevada. During the last five years at CES, the North Hall of the Las Vegas Convention Center has showcased the latest in autonomous, connected, electric and shared (ACES) transportation technologies being developed by worldwide auto manufacturers and their component vendor supply chains. This year, eleven automakers joined with more than 165 technology component manufacturers to showcase how the automotive industry continues to incrementally develop and enable practical solutions for these technology visions. 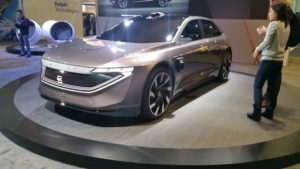 Automotive manufacturers represented at CES 2019 included Byton, Nissan, Honda, Toyota, Hyundai, Kia, Fiat Chrysler, Ford, Daimler, Audi, and BMW. Waymo’s Chryster Pacifica plug-in hybrid electric vehicle (PHEV) has additional lidar sensors to enable autonomous driving capabilities. Waymo has been testing autonomous vehicles on the Google campus in Mountain View, California and has also been testing its vehicles on real-world streets near Phoenix, Arizona. 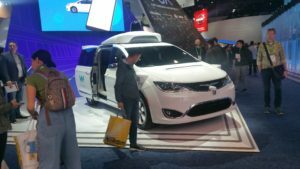 The Fiat Chrysler booth at CES 2019 showcased both a standard Chrysler Pacifica plug-in electric vehicle, as well as one modified by Waymo with additional lidar sensors and software that enabled autonomous driving capabilities. 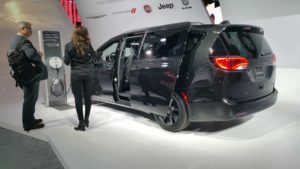 Standard, non-autonomous Chrysler Pacifica PHEV plugs into a J1772 AC Level 2 charging station at Fiat Chrysler exhibit booth. Baidu is a competitor to Google search engines in China, where many foreign Internet companies are not allowed to compete behind the Chinese firewall. As a result, most Chinese citizens use the Baidu search engine exclusively and the company has prospered to become one of the richest in the Chinese economy. 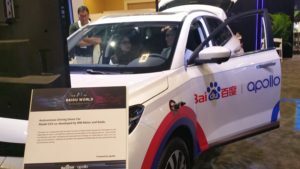 Baidu Apollo Autonomous Vehicle program from this Chinese company seeks to compete with Waymo and other international programs. Baidu has funded its Apollo self-driving program, to compete against Waymo, who is an Alphabet company under the same umbrella as Google. Baidu has hired European and Silicon Valley software engineers to keep up with the competition. 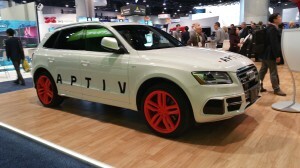 Aptiv has partnered with Audi to develop autonomous vehicle driving systems. Aptiv is another US technology provider for autonomous driving systems that spun off from Delphi Electronics a few years ago. Aptiv has offices in Las Vegas where it has been testing autonomous ride-sharing technologies in partnership with Lyft on the Las Vegas Strip since January 2018. An Aptiv autonomous vehicle can be hailed through the Lyft app on a passenger’s mobile phone and arrive with a human in the driver seat. However, human hands do not normally control the steering wheel. 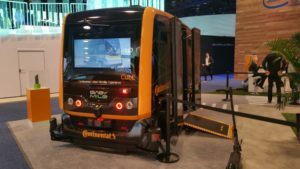 The autonomous level-3 car takes over that task, in order to deliver passengers to 20 different locations around the Las Vegas Strip, Downtown Las Vegas and the Las Vegas Convention Center. The human in the driver’s seat is just on hand to monitor data-gathering operations and vehicle performance, answer questions about the autonomous driving system to passengers, and only intervene in driving operations when alerted by the vehicle control system or during an unexpected emergency situation. Honda’s exhibit booth included a display of two autonomous off-road utility truck ATVs, to showcase the company’s efforts in this area. Level 0 = No automation. The vehicle is totally operated by a human driver with normal safety systems in place. Level 1 = Driver Assistance. This level of autonomy allows the vehicle throttle to either accelerate/decelerate (cruise control) or move the steering wheel without human control, based on feedback from environmental sensors. A human driver is required to be in the driver’s seat to operate all other driving maneuvers. Level 2 = Partial Automation. This level of autonomy allows the vehicle throttle and steering wheel to operate together to perform maneuvers like lane-centering without human control. A human driver is required to by in the driver’s seat to operate other required dynamic driving activities. Level 3 = Conditional Automation. This level of autonomy allows multiple advanced driver assistance systems to operate autonomously, but under human supervision by a driver, who is responsible to intervene at all times, in case dynamic driving situations create questionable responses by the autonomous systems. Normally, the autonomous SAE Level-3 driving system will alert the driver to an ambiguous scenario where human intervention is required. Level 4 = High Automation. This level of autonomy allows multiple advanced driver assistance systems to operate autonomously, and includes emergency situations where the driver might not notice a problem in time. An example is an automated emergency braking system that applies the braking system independently of the driver, after camera sensors detect a sudden roadside obstacle in a vehicle’s path. Level 5 = Full Autonomation. No human driver required. All dynamic driving operations are completed by the vehicle under all roadway and environmental conditions. During the next decade, new automobiles will be connected to their passengers, other vehicles on the road, road signs, traffic signals, GPS satellites, and a cloud of attentive computer servers. Multiple wireless signals from smart devices within the vehicle, as well as passengers’ mobile phone devices will drive this interaction. Voice, touch, and even gesture recognition systems will also allow passengers to interact directly with the display screens, cameras and microphone sensors attached to a vehicle’s infotainment and communication systems. Vehicles with electric motor drive trains, electric steering systems and electromagnetic regenerative brake systems are the easiest automotive platforms to integrate with autonomous driving systems. Response times to control signals are much quicker (in milliseconds) compared to vehicles that are equipped with mechanical fuel throttle systems or hydraulic steering and braking systems. Electric vehicles also have other environmental and economic benefits that are becoming preferred by more countries around the globe in response to climate change, pollution, and other problems affecting quality of life in those countries. 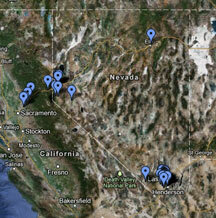 Nissan LEAF SL Plus has an extended range battery pack of 62 kwH that allows for 226 miles of range on a single charge. Nissan unveiled its latest LEAF SL Plus electric car with an extended-range battery pack capacity of 62 kilowatt-hours, that allows the electric car to travel 226 miles before needing to be recharged. No availability date for this new model of the Nissan LEAF was released by the company during CES 2019. However, the extended-range LEAF SL Plus will also be labeled worldwide as the LEAF “e+”. More information about rollout dates to local dealerships should be revealed later this year. 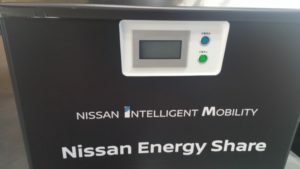 Nissan Energy Share System is a two-way charger system that can use Nissan LEAF battery pack to power a portable cafe. Nissan also demonstrated a Shared Energy Storage system. 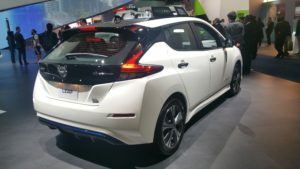 This two-way charging system allows the battery pack in the Nissan LEAF to be used to power appliances in a home or business, including a Macchiato-brewing cafe that was demonstrated in Nissan’s exhibit booth during CES 2019. The Nissan Energy Storage system plugs into the CHAdeMo charging port of the Nissan LEAF but can draw DC power from the Nissan LEAF battery pack and run it through an inverter circuit to power AC appliances in the cafe. Personalized cup of Macchiato brewed, photographed and imprinted from appliances powered by Nissan LEAF battery pack. 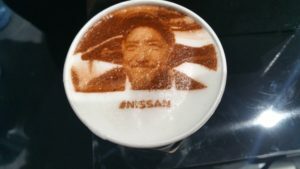 Electric power from the Nissan LEAF battery pack allowed espresso baristas to dispense personalized Macchiato beverages with frothy milk toppings that were coated with a powdery, edible image of a customer’s photographed face and the Nissan logo. The Nissan Shared Energy system is only available in Japan at this time, with no immediate plans to bring this product to the USA. Audi also showcased the new e-tron quattro electric car at its exhibit booth during CES 2019. The all-wheel drive e-tron quattro will be available in the USA at local Audi dealerships during the second half of 2019. Uber and Lyft have made inroads towards empowering vehicle owners to earn extra money by picking up passengers and get paid for providing a shared vehicle service. Fleet-as-a-service business models such as Zip Car have also pioneered the availability of cars that are not owned by their drivers but can be leased by consumers when needed. 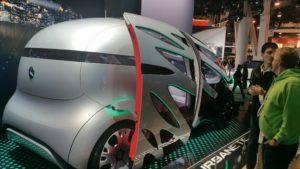 Several manufacturers and tier-one automotive industry suppliers demonstrated what autonomous, shared transportation pods might look like during the next decade. 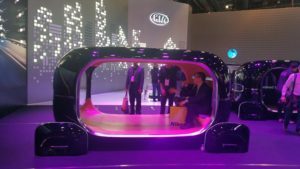 Continental, a tier-one component supplier for the automotive industry, showcased a shared transportation pod. Commuters employing multi-modal forms of transportation on their way to work and returning home may save money and time by choosing transportation options that don’t involve cars, such as shared bicycles or scooters that can be rented when needed. Meeting the transportation needs of urban city dwellers with fewer, shared vehicles can help minimize rush hour commute times for all drivers while also mitigating vehicle emissions and traffic congestion. The automotive market of China now surpasses the United States market in sales volume each year and has become a primary motivator for worldwide automotive manufacturers to meet Chinese government requirements for more electric vehicles in that country. The United States has been peaking in sales at about 17 million vehicles per year, while China has consistently exceeded 23 million vehicles sold per year since 2011. An explosion of Chinese start-up automotive manufacturers in recent years has followed the government’s transportation mandates. Some of these Chinese auto manufacturers are now looking to compete on the global marketplace with electric cars, as well. Byton M-Byte electric car from Chinese company in Nanjing, designed in partnership with German and Silicon Valley Engineering. Byton is an automotive manufacturer funded by Chinese companies Baidu and Tencent, with offices in China as well as Germany and the Silicon Valley in California. During CES 2019, the company made a big splash with displays of both its M-Byte and K-Byte model electric cars. The M-Byte will begin shipping within China this year, but the company plans to introduce the vehicle to the U.S. and Europe during 2020. Byton K-Byte Electric Car has embedded lidar sensors to enable level-4 autonomous driving. The M-Byte is being designed and built to achieve SAE Level-3 autonomous capabilities. The K-Byte electric car utilizes embedded lidar sensors to enable SAE Level-4 autonomous driving capabilities. 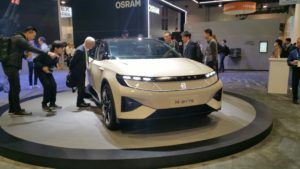 The K-Byte production vehicle will be introduced by Byton to the worldwide automotive marketplace in 2021. Chinese companies have also been buying up established brands. Geely owns Volvo. Wanxiang Group purchased the intellectual property for the Fisker Karma during 2014 and rebranded the company as Karma. A new electric version of the Fisker Karma is now called the Revero. 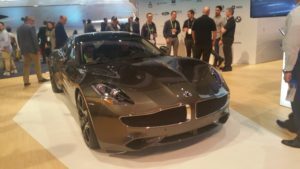 Karma’s Revero, formerly Fisker Karma, is now a Chinese company owned by Wanxiang, while future designs for Karma will be developed by Pininfarina, now owned by Mahindra in India. Karma is partnering with QNX, owned by Blackberry, to develop secure, embedded software control systems within its vehicles. The company is also partnering with the legendary Pininfarina design house in Italy, to develop new eye-catching artwork on wheels. India companies are also making progress in future automotive design and production of electric vehicles. Pininfarina in Italy is coincidentally now owned by Mahindra, an Indian company that has also successfully fielded an international Formula E racing team that has won races over the last four years during high-level technology competitions. TaTa Motors owns Jaguar Land Rover, that has designed and built the Jaguar I-PACE to compete against the Tesla, Inc. Model X in the electric luxury SUV market worldwide. Production models of the I-PACE have been arriving at local US dealerships since the 4th quarter of 2018 to favorable reviews by automotive writers. 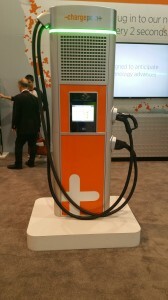 ChargePoint from the USA and EVBox from Sweden exhibited their electric vehicle supply equipment (EVSE) product lines during CES 2019. Both companies are promoting sales of equipment for private and public charging stations that include SAE J1772 AC Level 1 and Level 2, as well as DC Fast Charge systems starting at 50 kilowatts. ChargePoint DC Fast Charge Systems are scalable to 500 kilowatts for future EVSE applications, while EVBox is developing a 125-kilowatt DC Fast Charge station that it will introduce during 2020. Prologium from Taiwan exhibited lithium ceramic battery cells that use solid state technology, without a liquid or gel electrolyte. 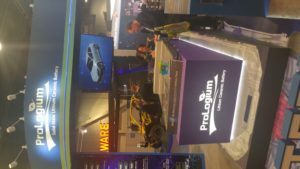 Prologium from Taiwan exhibited their lithium ceramic battery cells that have been configured, integrated and scaled up into an EV-sized battery pack that takes up less space than conventional lithium-ion cells. Prologium battery cells are built in layers using solid state technology, without a liquid or gel electrolyte, compared to typical lithium-ion batteries used by other EV battery manufacturers, including the Tesla, Inc. Gigafactory in Nevada. Prologium exhibited small-pattern cells that the Taiwan company has sold and distributed to OEMs for portable consumer products in the past. The company is testing its EV-scale battery packs with the intention to sell and distribute them to automotive manufacturers during the next five years. CES 2019 in Las Vegas once again pointed the way to some promising new automotive technologies that may become available to consumers over the next decade.